Learn the basics of how to build your own succulent terrarium! Ever imagined learning can be so good and therapeutic? 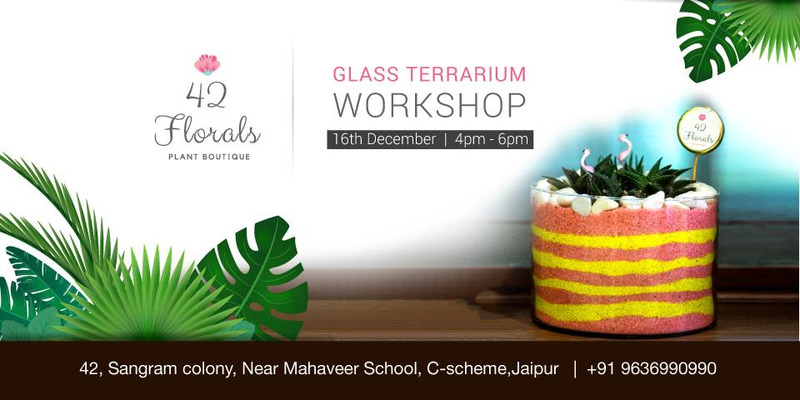 Well this time it is, As a part of this artistic workshop, you will learn to design a terrarium using vivid colour and décor material, the participants will learn a few simple techniques that transform plants, sand, soil, and creativity into breath-taking terrariums. With plenty of demonstrations and hands-on help along the way, you'll practically be a terrarium guru by the time you leave! At the end you get to take your handmade creation to your loved ones and continue making more. Dress casually, in clothes you don’t mind getting a little soiled. If you have mini figurines or keepsakes that you would like to add to your masterpiece please bring them along. Carry a re-usable carry bag so you can safely take your creation home. A great event to participate in, these workshops offer the perfect blend of fun and awareness and are a great way to ensure that you improve your home décor while keeping the environment secure.